Perfectly serve Cowboy Caviar as a side dish and or as an appetizer. The easiest and most simple dip to make in 15-20 minutes. Every bite includes a sharp sweet flavor. This recipe includes fresh lime juice, garlic powder, white wine vinegar, and sugar to name a few. A great recipe to include as a salad topping or taco filling. This veggie cattleman caviar or Texas salad as it is sometimes referred to is the easiest side dish you could make and is sure to be a crowd pleaser. If you are press for time, this salad can be made the night before. Did I also mention that this recipe is also healthy? 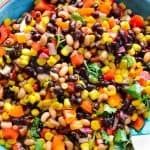 I first came across cowboy caviar on Meggan’s blog, Culinary Hill, a year or so ago when I was looking for side dishes for my BBQ gatherings. I altered the recipe by adding my own touch to it which has now become a staple in my home for small gatherings. This cowboy caviar or Texas salad has been requested so much, I can now make it with my eyes closed. The acidic flavor from the lime, and the white wine vinegar along with the sugar give this side dish a savory sweet richness. It is a simple recipe that can be made quickly or ahead of time. This recipe is also delicious with BBQ meat, hence the reason why I sometimes pair it with my BBQ Chicken recipe. Goes well with plain tortilla chips. When prepared ahead of time, it allows the opportunity for the flavors to fully settle. Refrigerates well. Reheat well. What’s included in the Cowboy Caviar recipe? All you need is a large mixing bowl to prepare this mouthwatering salad. Rinse, drain, and pat dry the beans before adding them to the bowl. Drying the beans leaves no room for unwanted liquid. The longer you let the flavors settle, the richer the flavors become. Add ½ tsp. of cayenne pepper to give the dip a little kick. This Texas Salad can also be made with balsamic vinaigrette or any vinaigrette of your choice instead of adding white wine vinegar. I’ve even made it with raspberry vinaigrette. First and foremost, drain and rinse your beans and corn. I used a couple cleaned paper towels to pat dry the beans and corn after they are rinsed. Using a cutting board, chop and dice all of your vegetables and set them aside. Press and roll, cut the lime in half. Add all of the dry ingredients first then add all of the liquid ingredients one at a time. Savory Thought: The master is a beginner that never gave up. – Avina Celeste. Did you make this delicious Texas salad? Tag me on Instagram or Facebook and please give it a star rating below! Drain, rinse and pat dry the beans and corn. transfer to a large bowl. Add the cilantro and the remaining ingredients to the beans and corn mixture. Stir to combine. Serve cold or at room temperature. Lightly warm the salad if refrigerated overnight to loosen up the liquid/oil or thaw for 1 hour before serving. looks so delicious… this would be perfect for a summer barbecue! This recipe looks like the perfect dish to take to summer bbqs! Love cowboy caviar! Exactly! It’s always a crowd pleaser, Shannon. This BEST Cowboy Caviar Recipe looks so delicious! I will definitely make it soon. 🙂 I really like how you served it with plain tortilla chips! Thank you, Helena! let me know how you like when you do make it. It’s a great balance with plain tortillas. That looks delicious! Do you every warm up the beans? Thank you, Mirley. Yes, I have warm up the beans lightly when it is made ahead of time. Just enough to loosen up the oil. this looks like the perfect summer appetizer!!! i love how colourful and fresh it is too! This is not only delicious, but such a colorful and pretty dish to place on your table when doing some summer entertaining. I like how you can make it ahead of time. Thank you, Vicky. It does save a lot of time when it is made ahead of time. I’m loving how colorful this dish is! Great recipe for serving poolside or for a grill out! Thank you, Jill. It is very colorful. One of my favorite sides dishes to make. The colors in this dip are absolutely fabulous!! Your tips are awesome too… I will definitely be trying this to take to an upcoming family gathering! This looks perfect for block parties and as a side dish to grilled chicken and fish. So colorful! I love the addition of cilantro – it makes everything that much better! I keep seeing this on Pinterest, but I really need to try it. I am loving all the colours going on! I love cowboy caviar!! This looks so fresh and colorful! Great! Please let me know how you like it. This looks so delicious. I’m making this for my next pot luck cook out. This is beautiful!!! Although I’m not a fan of beans, my husband would eat this up in a heart beat! I can’t get over those colors though wow! Yum! I have heard of cowboy caviar but haven’t tried it myself yet. I love all the color from those vegetables! You must try it as it is addictive. I love the name cowboy caviar! This looks like a great side to serve at bbques! Love the combo of ingredients! That’s wonderful to hear. I hope you like this version as well. 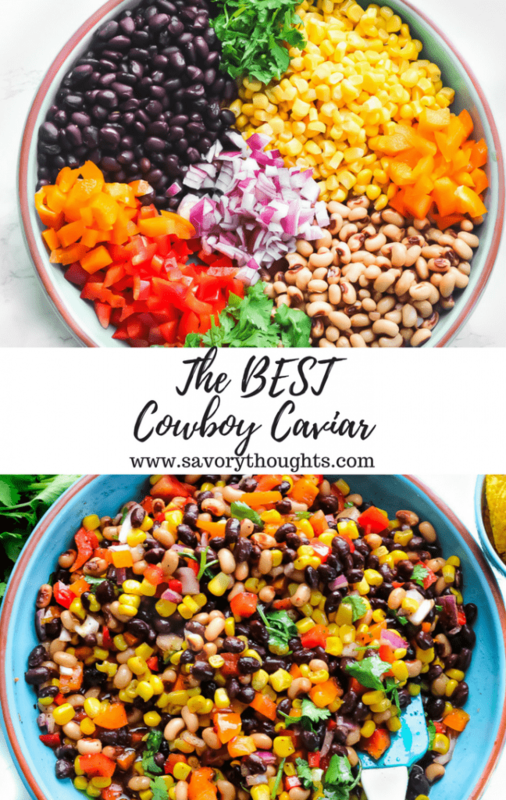 I LOVE Cowboy Caviar, and think the name is the best thing in the entire world! This looks absolutely delicious and I cannot wait to make it for my next BBQ. I’ve never heard of cowboy caviar before, but it’s definitely my kind of caviar! Those fresh colors are beautiful. I imagine it’s perfect for a bbq and tortilla chips. Thanks for the recipe! Those fresh colors deserve a rating too! This cowboy caviar is calling my name. I want to try it out. I like that you dried the beans first. I think I would have to cook the beans just a tad. Can I cook them or will that ruin the dish? You can definitely cook them. But I would only cook them for no less than 5-7 minutes. You don’t want to loose the texture. I love this kind of caviar and beans are my all time favorite. I put them in my salads all the time. This would be a great addition to any meal and perfect for any appetizer. 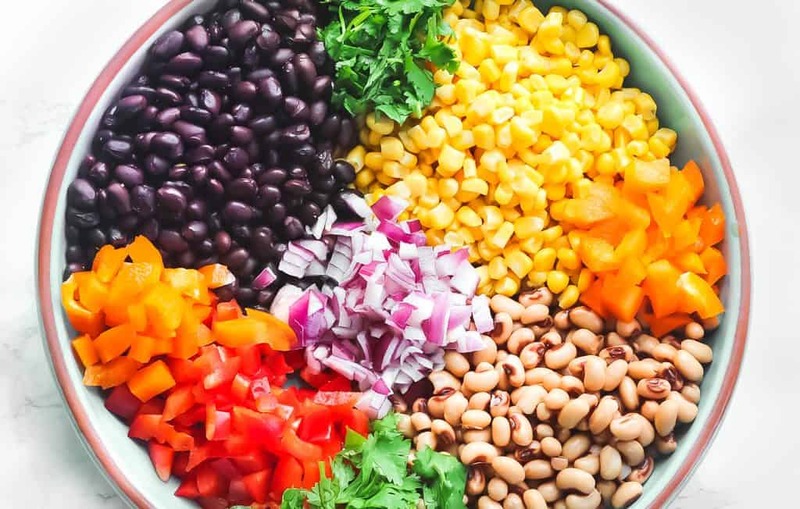 That is such a colorful and delicious looking black bean salad. It has all my favorite ingredients — black beans, corn, peppers, black eyed peas — yum, yumm!! This is just perfect for a summer gathering. Thank you for sharing. I’ve heard of Cowboy Caviar before, but have never had it! It’s so colorful and looks perfect for outdoor entertaining this summer! Definitely giving it a try! 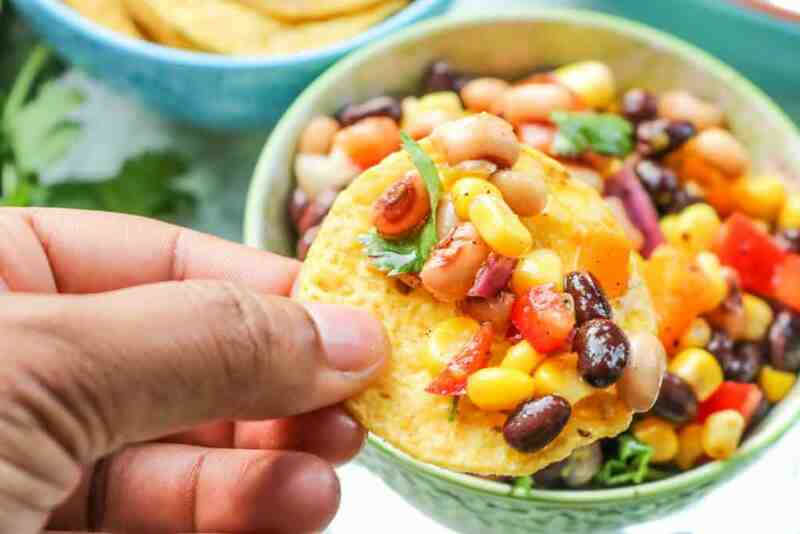 such a classic and perfect addition to grilling season I enjoy fresh and easy recipes that you can make and enjoy by everyone because who doesn’t like a bean salsa yummy! Now that looks like one nutritious and healthy bowl of goodness. I love how colorful this is and I love all the beans you have there. Sounds so yum. This would be lunch for me!! Oooh!! That looks so good and a perfect side any time of the year. We are going to have several family gatherings this summer and it would be great to have the Cowboy Caviar on the menu. Cowboy caviar is something my husband would it with two spoons. The name is absolutely hilarious but so true! Talk about perfect summer food! What a gorgeous dish and the flavor combination is perfect. This would be the ideal bowl of yumminess at every summer BBQ! Wow, first time I ever tasted cowboy caviar and so glad I picked this recipe. Absolutely delicious! I almost didn’t make it when I saw the high calorie count of 412 per serving. That didn’t seem right for the ingredients so I entered it on MyFitnessPal recipes. The count there is a much more reasonable 179 calories. I’m hoping they are right and enjoying every bite! Thank you for a fantastic recipe. Thank you very much, Sharon. It does sound much more reasonable. I will adjust that. I am so glad you enjoyed the recipe and I am SO glad to hear you are enjoying every bite. We love it in our home. I have not tried MyFitnessPal. I’ll definitely look into it. Thank you for your comment! You do not have to be a cowboy to love this dish. Hahahaha! You are right, Ken!!!! This caviar is loved by all! 🙂 Thanks for reading!! This looks amazing! I love all of the vibrant colors. Wow, this looks amazing! I love all the beans (my faves!) and how colorful it looks! Loving all the colours going on there! This would go down very well at a party! Than you, Ann. Hope you enjoy it. Looks so good my mouth started watering reading the post! I have always been a huge fan of cowboy caviar!! I haven’t had it in YEARS but now I think I need it!! Oh No! Wait no longer. We love it in our home. Oh we loooove Cowboy Caviar in our house! Such a yummy snack and always loved at parties!!! It is a great snack. We LOVE IT too! We love cowboy caviar, and make it weekly. Your recipe looks amazing, Looks like the perfect dip for any picnic!